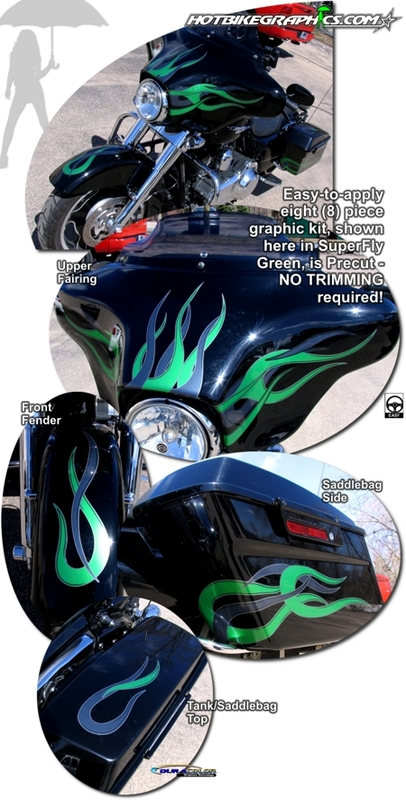 Set your bike apart from the rest with this hot-looking eight (8) piece Blaze Graphics kit! Available in one (1) of three unique Kandy colors (SuperFly Green, Inferno Orange or Blaze Blue) flames feature metallic graphite, charcoal and black flame and pin elements. Digitally printed with our DuraCOLOR graphic technology, kit is manufactured with premium motorcycle grade vinyl film materials. As a further step, graphic is covered with a 2.5 mil clear laminate which provides protection from miles of abuse.